"Sometimes My Heart is About to Burst"
Hardcover with jacket, 192 pages, 13.5 x 21.5 cm, 5.3 x 8.5 in. 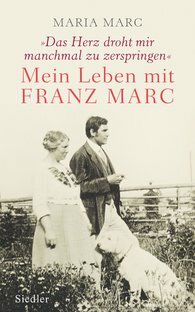 In 1905, the painter Maria Franck met her colleague, Franz Marc. By 1913 they were married. Maria Marc's records put the spotlight on her husband and artist Franz Marc. She keeps quiet neither about his periods of melancholy nor about the self-doubts driving him to destroy many of his early works. She poignantly but amusingly and with many anecdotes reports on all matters concerning love and marriage, including her own despair. She tells of periods of optimism and important friendships on the way to the exciting Blauer Reiter epoch, and goes into how she experienced the war years and her widowhood. The editor of this volume, Brigitte Roßbeck, bought the handwritten memoires of Maria Marc in an auction and has made these documents of great personal and artistic power accessible to the public for the first time. "An honest book with intelligent analysis."